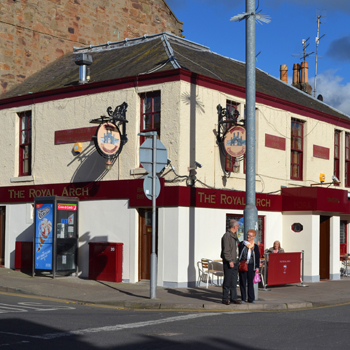 "The Royal Arch occupies a prime location in Brook Street Broughty Ferry. A cosy and pleasant ambience creates a relaxing atmosphere to enjoy your meal and drinks." The Royal Arch and logo were associated with The Royal Arch monument built in Dundee during the 1840s to celebrate the visit of Queen Victoria and Prince Albert in 1863. The monument was demolished in the 1960s to make way for the Tay Road Bridge. However a fragment of this Victorian arch is on display at the bar. The Royal Arch is now owned freehold by Jonathan and Alison Stewart, son Jon and daughter Jenny We offer an extensive menu to cater for many different tastes. Our freshly prepared menu may be served in the Art Deco styled splendour of our Bistro Bar, formerly the stables. 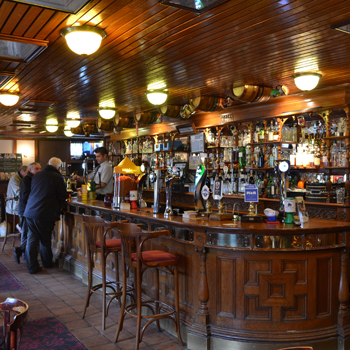 Or why not dine in our historical Tavern Bar, blessed with authentic hand-carved solid oak gantry and bar (circa 1849). Renowned for its promotion of fresh local produce our menu ranges from light snacks and healthy options to traditional fayre, and favourites from around the globe. The Royal Arch was recently elected Gold Winner in Dundee City Council’s Best bar None Awards, winning the ‘Scottish Community Pub of the Year ‘ in The DRAM Scottish Licensed Trade Awards. Visit Scotland’s incognito inspector says: “The Royal Arch Restaurant occupies a prime location in Brook Street Broughty Ferry. On entry the interior is cosy and the stained glass displays add colour and character. Fresh flowers on the tables create a pleasant ambience and the atmosphere is relaxing to enjoy your meal or a lighter option if you so desire, capably served by friendly and efficient staff”. Eat Scotland acclaimed, CAMRA British Good Beer Guide listed, Caskmarque accredited, Bon appetit!. The Royal Arch is CAMRA AND Caskmarque acclaimed for quality and range of cask ales. Benefitting from deep, dry cellarage our stillage team is supervised by CAMRA 1994 “BEST IN UK PUB OF THE YEAR” award winning publicans, Jonathan Stewart & son. A wide range of malt whiskies (over 50) served in 35cl measures and interesting wines including The local Cairn o’ Mohr fruit wines are also feature along with the usual aperitifs and drivers’ shelf. We offer an interesting selection of wines offered in measures ranging from the unusual but practical 12.5 cl, right up up to the 25cl. Why not drop in for a coffee by Brasilia espresso machine – there are many styles to choose from. The Royal Arch is the perfect venue for watching major sporting events whether on Sky or terrestrial, with both areas of the bar having televisions, two of which are large screen. Private parties too can be fully catered for with our 1am licence on Fridays & Saturdays. Situated overlooking the hub of Broughty Ferry’s centre, our seasonal pavement cafe is ideal for people- watching! Friendly and helpful staff complete the picture to make you feel welcome and to help make your Royal Arch experience cherished. 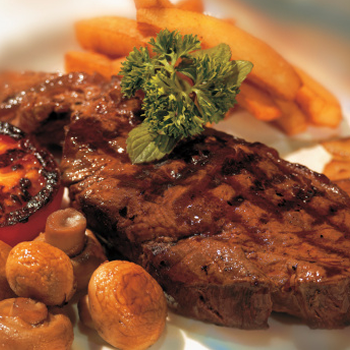 Please take a minute to browse through our menu using the links below. FRIES OR POTATOES OR NOODLES OR RICE AND SALAD OR VEGETABLES INCLUSIVEn = Contains Nuts | mf = Meat Free | F = Fish dishes may contain small bones. If a particular vintage or shipper is unavailable, a suitable alternative will be offered. All quality wines on this list have an alcohol content of between 8% and 15% by volume. 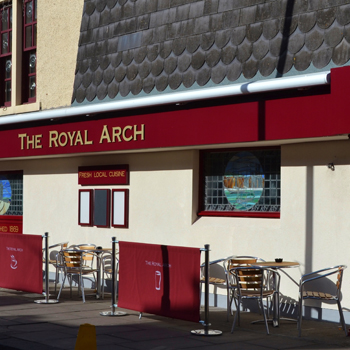 Perfectly situated at the hub of Broughty Ferry, finding the Royal Arch couldn’t be easier. We are loacated directly beside the Train Station as well as having the benefit of car parks, and bus stops for all major routes on our doorstep.